Next to Christmas, a day most little kids love the best is a birthday. A gentle reminder for them to remember why we celebrate Christmas is this project that combines Christmas and a very special birthday. The Jesus and angel faces are left blank on the pattern to give the students an opportunity to make their picture unique. The patterns and directions for this project, “Happy Birthday, Jesus,” can be found in the 2nd Grade Projects Gallery in the sidebar. 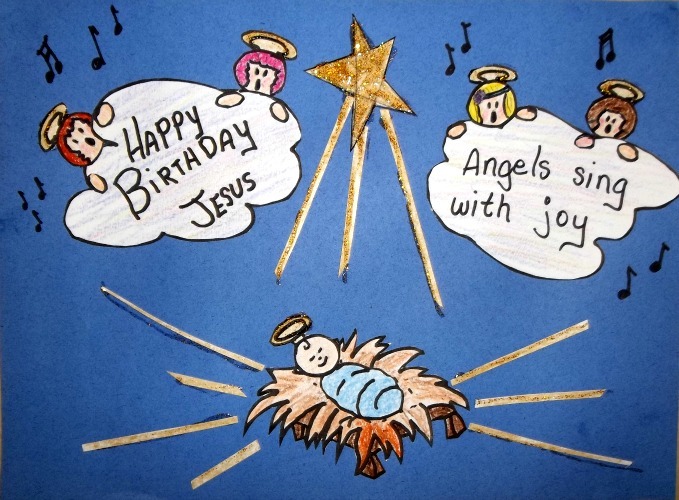 This entry was posted in Categories and tagged 2nd Grade, angels and jesus, angels sing, celebrate jesus birthday, Christmas, happy birthday jesus, jesus birthday, second grade. Bookmark the permalink.